On January 30th, the Canadian Communications Giant Bell Media takes the Twitter airwaves by storm with its now extremely popular annual #BellLetsTalk day, a hashtag campaign designed to end the stigma around mental health issues by encouraging conversation while raising awareness and funds for mental health care initiatives. 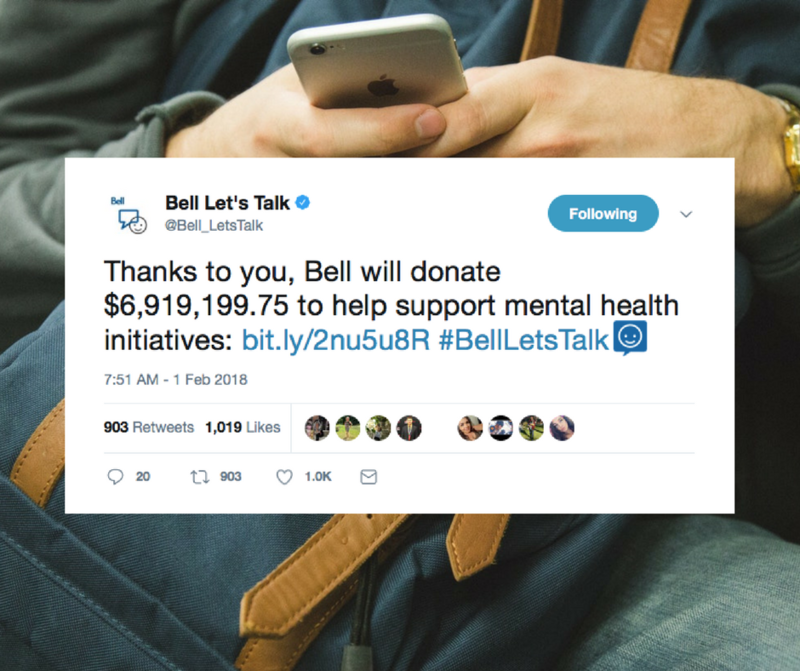 Their 2017 campaign blew past all previous records, clocking in at a whopping 133 million interactions, which translates to over six million dollars in donations from Bell. Awareness campaigns have been critical in tearing apart the cultural myth that mental health is something to be ashamed of and somehow less worthy of Government Health Care funds than physical health. Over the years, people from all walks of life – from politicians to celebrities to sports stars – have stepped into the spotlight to talk about mental health issues and tear down the stigma. But when you’ve been diagnosed with a major mental illness, hashtag days like #BellLetsTalk can feel very frustrating and – perhaps ironically – isolating. For some of us, it’s not always safe to talk about mental illness, be it in relation to ourselves or a loved one. Once when I came back to work after an absence, a co-worker jokingly asked if they should check my desk for weapons – and my workplace is generally very open and accepting. Sometimes it’s hard to open up to someone about your mental illness and have them respond with “yes I have bad days too.” While you don’t want to invalidate their experience, a really bad day for someone who is generally mentally healthy does not correspond to what people with serious mental illness go through. It can be very challenging to then have to explain – that’s not really what I meant, I was thinking more of the months of not being sure if you are going to live through the day, etc. For people with serious mental illness, it’s a lot about waiting. Waiting for doctors. Waiting in police stations for your child. Waiting in emergency rooms to find out what’s going to happen to your kid. Waiting to hear from your missing loved one. Waiting to figure out if you are going to make it as an adult. 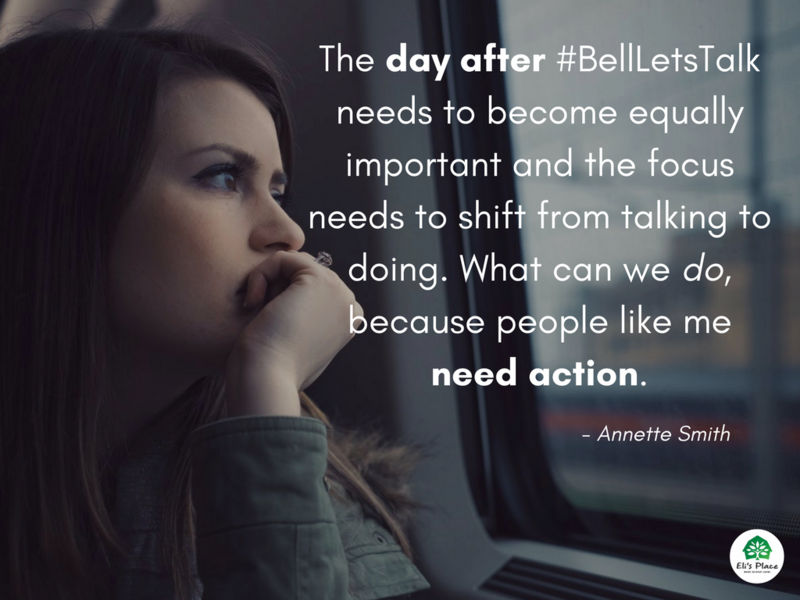 So it’s good that people in general are talking about mental health issues, but the day after #BellLetsTalk needs to become equally important and the focus needs to shift from talking to doing. What can we DO, because people like me need action. We don’t always have the time to wait for the results of long-term studiesor for Governments to put money behind their words. David and Deborah Cooper have put the ‘doing’ at the heart of their actions as they’ve created the framework for Eli’s Place, which will be a rural residential treatment facility for young adults experiencing serious mental illness. Eli’s Place is all about that much-needed doing. Farming, cooking, creating and living in the community combined with varying degrees of support until you can be independent is the space that people like me need right now, in addition to feel-good hashtag days. Youth – and their families – need a place to go where it’s safe to be open about what’s happening to us and will act in a timely fashion to start us on a path to a life of recovery and meaning. Eli’s Place will be that place. Please look around our website, learn more about what this group is doing and consider supporting us so that we can support the young people who need it the most. We’ve talked. For the other 364 days, let’s find a way to do as well, and make the day after #BellLetsTalk a day of ACTION.